Like seals and sea lions, dolphins and porpoises are often confused for each other. There are a number of diferences between the two species. Dolphins are long, and have a distinct pronounced beak, while porpoises do not. The dorsal fin on a on a porpoise is smaller and more triangular, than those found on a dolphin. In most dolphin species the cervical vertabrae are separated, allowing for fluid movement, in porpoises a portion of the cervical vertabrae is often fused, which restricts their "neck" movement. In general porpoises are smaller than most dolphin species. Dolphins have cone shaped teeth, while porpoises have spade shaped teeth. 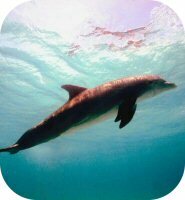 Dolphins are far more prevalant than porpoises and do to their friendly nature, dolphins are observed more frequently.